Hi there! 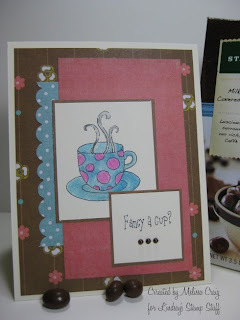 I'm really late today because I usually have a MyGrafico Monday challenge card today, but I am so excited that MyGrafico has agreed to sponsor my Tuesday Morning Sketches challenge blog, so we've combined forces. Martha, myself and the rest of the team will be posting tomorrow. So I didn't get much done in my craft room, so I've been busy working on a card this morning and I have developed a habit. I love Netflix and especially the Watch Instantly option. After the kids go to school it's really quiet around here, so I put on a movie. I generally try to put something on that I've seen before so that I am free to just listen. However, sometimes that doesn't always work. Haha! Anyway, so here's my card to participate in Anyone for Anya and The Pink Elephant challenges. 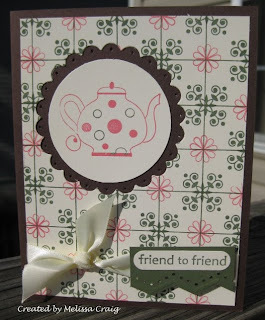 Anyone for Anya has a great sketch and TPE has a recipe; dots and punch tag. I also challenged myself to use more out of my stash. I've had this card stock for a long time from Papertrey Ink and the ribbon - so now it's time to put it to good use. What do you think? I colored the image with Copics. I can't tell if this outfit is pajamas or not, but she does look comfy! 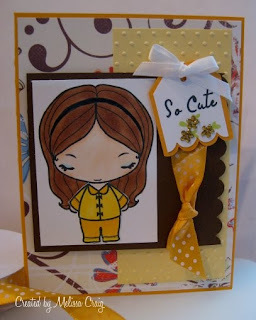 The card stock is Summer Sunrise and Lemon Tart from Papertrey, Summer Sunrise polka dot ribbon, also from Papertrey Ink. The dp is something I picked up at Michaels. Image is Dress Me Anya and Dress Me Anya Wardrobe. OK I won't finish that. LOL!! I told you the image was cute and sweet! Head on over there and join in the fun and score yourself a freebie. Good Morning! It's rather unseasonably warm here the last couple of days... yesterday was just downright HOT! Makes it rather difficult to display Fall cards and talk about a crisp chill in the air. So I went with an All Season type card today. I did use the sketch from The Pink Elephant. This is Oriental Poppy and I have to say that I'm very intimidated by this image. Not an easy one to color and give it the glory that it deserves. I does look much better in person than it does in this photograph. I think I need to quit being so cheap and just get another lamp for my "studio" or get my rear in gear earlier in the day and use natural light for the photo. Anyway, as I said, I used the sketch from The Pink Elephant and the color combo was inspired by this week's challenge at The Sweet Stop but I can't enter that one because it has a sketch to go along with it. The paper is something I probably picked up at AC Moore a year or so ago and I love that shade of red! Gorgeous!! The sentiment is computer generated. Thanks for stopping by and be sure to visit Lindsay and the rest of the team for some great inspiration. Just a quick post today. 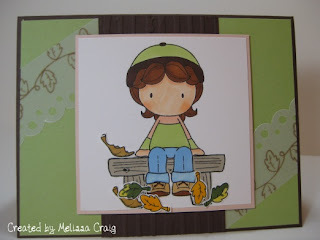 This is the card I made for my challenge blog Tuesday Morning Sketches, using a sketch I posted yesterday. I love this card. I love Apple Emma from All That Scraps. Be sure to check out my challenge blog, I'd love for you to join us. I have a card to share with you that I am so pleased with how well and how fast it came together this morning. All That Scraps is sponsoring my challenge blog this week so I'm continuing my theme using the stamps that my sister sent me for my birthday. But I participated in a different challenge, I once again, used one of Mercy's sketches from Lord Have Mercy blog. This is such a great sketch, so user friendly. I apologize for the photo quality, it's really overcast today. But isn't she sweet! 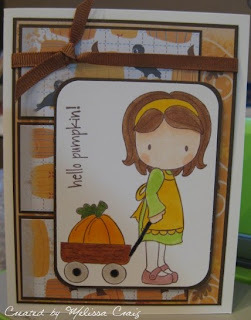 This is Pumpkin Emma and the sentiment is from the Autumn Sentiments set. The paper is from Recollections: Autumn. I colored her with my brand new Copics! 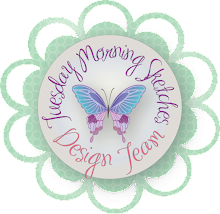 I hope you enjoy my card and that you join me and my fabbo design team over at Tuesday Morning Sketches. Good Morning! Happy Monday to you! I hope that you're week is off to a great start. Mine will be a little busy with Brendan's Orthodontist appointment this morning and then Levi goes back to the Orthopedist on Thursday. I'm also hoping for a job interview in there, too. I applied for a part-time position that I think would work well for me. Cross your fingers. This is the set you can win, but you have to try. Of course it would be very nice if you used MyGrafico images but you're not required to. I hope that you join us! Be sure to visit the rest of the design team for some other great cards! I saw one with this same image that is ADORABLE!! Thanks for stopping by. I usually don't post on Sundays so I'm probably talking to myself here. 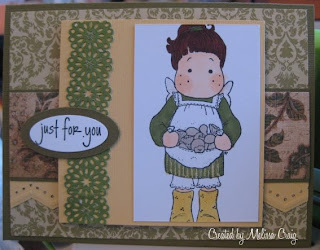 But I did want to post a card that I made a few days ago for the Just Magnolia challenge blog. I'm trying to participate with their challenges as often as I can to use the great kits that I got in a swap that I was in earlier this year. This is Tilda Gathering Mushrooms and I have to say that I am so glad the maker of this kit put that on there because I had no idea what was in her apron. Hope you like it. Off to watch a movie with my hubby. Thank you to everyone for all your wonderful comments yesterday and the well wishes. I am feeling much better today. After two days of stomach pains and a nagging headache, I am over it. I have a couple of things to share with you today. I've been talking, lately, about Kristina Werner from KWerner Designs. Well, she's inspired me again and really hit home this time. If you don't know her, I've linked her blog and you have to check out her You Tube videos. She features two spots, Make a Card Monday and Finally Friday. 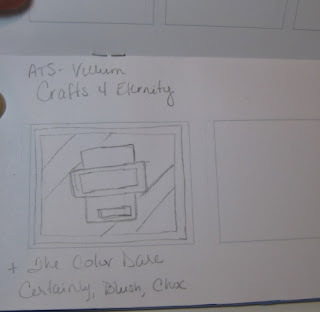 She featured how to create a simple card sketches book and provided a free template. This is the greatest thing. I swear, I am going to make tons more! So here's the cover of the sketch book. You don't want to add a lot of bumpy things to the front. You need it to lay flat so the bumps don't hinder your drawing. So I used Brocade Blue and broke out a Simply Scrappin' kit that I've been hoarding for years. Decorated the front a bit with some borders, dots and the frame. Then I had these leftover letter stickers from American Crafts, so I used those for the title and then had to write in the rest with my white gel pen. I truly admire those who have beautiful handwriting. I wish I were one of them. This is the inside. Kristina provided boxes on this template for both portrait and landscape cards. You fill in the rest. I am using this book to draw out sketches for challenges I want to participate in. Then I write above the box which challenge that belongs to and then I've written other challenges I wish to incorporate it with it. 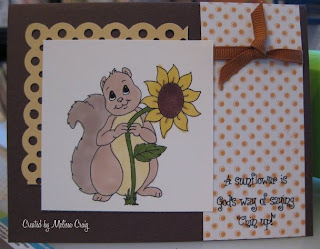 So here's the card I made using the sketch from Crafts 4 Eternity, the colors Chocolate Chip, Certainly Celery and Blush Blossom from The Color Dare and Vellum from All That Scraps. I hope you liked my projects that I have for you today. Thanks for stopping by and enjoy your weekend! I don't know if I've ever told you that I love fairies. I have lots of favorite things... fairies, snowmen, tea sets, flowers, etc. Well, I decided to host a swap on the Paper Makeup Stamps forum and well, to say the least, it wasn't a hit. But I did swap with a wonderful and talented stamper, Alex. I didn't want her to feel cheated so I sent her every PMS card I had made that was in my stash. But when I set up the swap my intention was the +1 was going to go to Katie. I'm keeping my promise. Here is my card that I'm sending to her. Also it was my turn to host the Sept 15th challenge for the challenge group I belong to. I chose the lattice technique. I still have to make my card for the challenge, but this card gave me great practice. I hope Katie likes it. Well, off to work on another card that I hope to have posted later today. This has to be a super quick post because Levi is to get his cast today, so we'll be off to the Orthopedic Specialist later this morning. 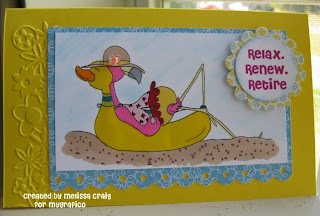 Today is the day where I share with you what I made for the MyGrafico Challenge blog. It's really beginning to feel like Fall here. The last few days have been overcast and drizzly but yesterday was really gorgeous but windy. I'm worried what that wind might blow in. Haha! 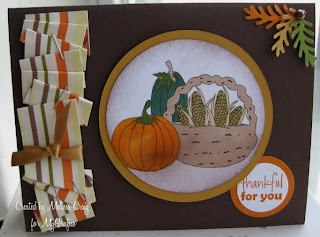 The MyGrafico challenge this week is all about Fall and it's a recipe challenge. 1-digi, 2 designer papers and 3 embellishments. I used an image from this set you can find here. I hope that you join us! 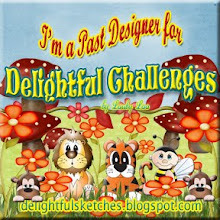 Be sure to visit the the MyGrafico Challenge Blog for all the details. Oh! 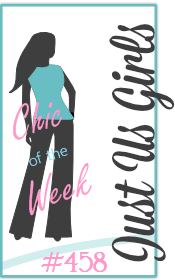 And you might want to keep tabs on the blog because some changes are coming that you are going to LOVE! 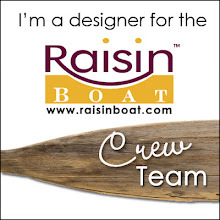 Also, visit the design team's blogs to see all the lovely creations they have to share with you. They are all linked in my sidebar. 1-Digi: This is from the Autumn Elements stamp set (linked above). 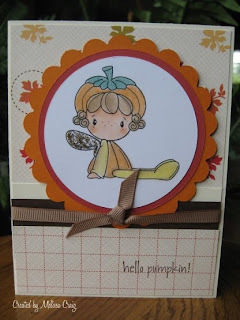 The sentiment is from CC Designs Autumn Kit. Love it! I punched out some leaves and attached with a brad and then added some ribbon around the first piece of decorative paper that I did a haphazard fan fold and attached with staples (3 embellishments). This is the inside view where I featured the other piece of decorative paper along with a wonderful quote from President John F. Kennedy. Well, Levi survived his first day with the soft cast. He did stay home with me yesterday but he's back to school today and I'm sure he's soaking up the attention! 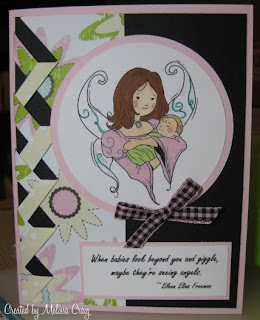 I have a card to share with you that I made with the newest Sweet Pixie from CC Designs. Her name is Pippi and she's such a pumpkin! 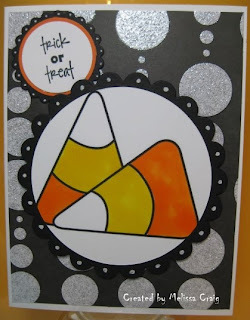 This card is using the sweet sketch from Sweet Sketch Wednesday and the colors from Color Throwdown and I am loving these results. So as I said, the image is from CC Designs - I buy the digi's because of their cost effectiveness but more because I can download instantly! Got to love that. I colored her with my Koh-i-noor pencils and OMS, then aged just a bit with a touch of brown around her edges. I love that effect. 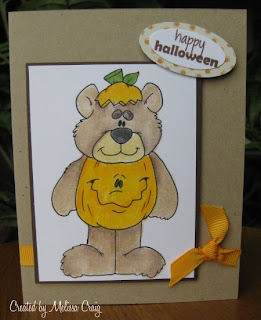 The Color Throwdown challenge was to use Pumpkin Pie, Ruby Red and Close to Cocoa. I'm out of Close to Cocoa card stock so I added Chocolate Chip and then used a Close to Cocoa (equivalent) grosgrain ribbon. I love how the dark brown behind it really makes that ribbon stand out. The decorative paper I used is from a paper pack from Papertrey Ink. The sentiment is also from CC Designs. Thanks for stopping by today. I look forward to another visit another day. Oh! One more thing I've been meaning to mention. I know that I told you for each pre-order purchase you make on the winter line at Sunshine & Giggles a $2 donation will be made to help Paige Welch's parents with their medical expense. But Janice announced that you can also purchase the entire winter line for $40. That's a savings of 50%!! Holy Moly!! Also for every purchase of the entire line $20 will be donated to the Welch Family. What a deal. 10 great stamps for half the price and you're still helping this family who is in real need. Today's regularly scheduled post has been preempted by this special message. Fellow blogger Erin is reaching out to everyone who will take a moment to send a card to a 13 year old girl that needs your words of encouragement. Paige was seriously injured in a recent boating accident which resulted in part of her arm being amputated. Doctors are working very hard to save the rest of it. You can read all about Paige's story here and how you can help. Many wonderful stamp companies have donated stamps to Erin's blog candy give-away but Sunshine & Giggles is running a pre-sale promotion. Any stamps from the new winter line sold between September 7th and October 31st, $2 will be donated to help this family with the medical expenses that await them. These stamps are not yet available so this is a pre-order and are expected to ship on October 1st. Here's a sneak peek on what's coming in the new line. 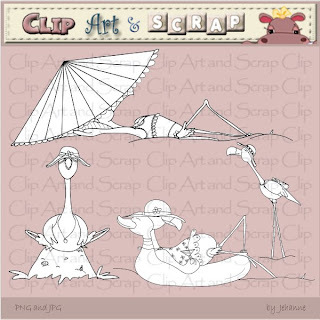 Click here to see all the new stamps that will be available soon at Sunshine & Giggles. 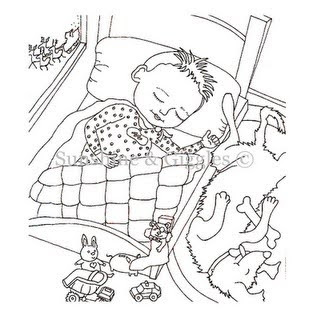 Janice has a new illustrator and she's simply fabulous!! I hope you'll help out. My card went in today's mail, I hope you can do the same. Good Morning - Happy Labor Day!! I hope you're enjoying your nice long weekend. Did you have fun last week with the week of prizes at MyGrafico? I know Martha and the design team had a blast with the blog hop! We are back to our weekly challenges and we have 2 new design team members! So this week's challenge is Back to School. We used an adorable stamp set that can be found here. When I made this card my kids exclaimed "Madeline!!" and that is what she reminds me of, too. I used a black base for my card. My sister is a 2nd grade teacher so she can get all these really neat school items that are great for cards, she sent me these self-adhesive library pockets and cards. That provided a cool embellishment and sentiment for my card. I tried to write the sentiment like Kristina Werner does - she does a way better job than I did! The alphabet background paper is actually another digi that I got from Lindsay's Stamp Stuff. 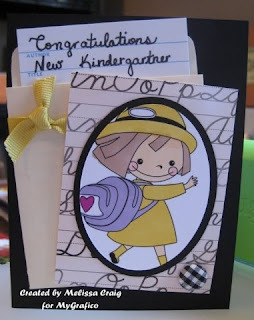 This card will be going to another special little girl I know that started Kindergarten. Be sure to visit the MyGrafico Challenge blog for all the details of the challenge. Then sit back and relax while you visit the other design team member's blogs to see what adorable projects they have for you. I've seen some and you're in for a treat! As always, they are linked in my sidebar. As for Sunshine Mondays, Janice and the design team are taking a little break while we gear up for the new release that's coming soon. Stay tuned for that!! I think most kids are back in the full swing of school, but I know a special little girl that is heading off to kindergarten very soon. I made this card to participate in some challenges but with her in mind. 1) The Digi Shack has a recipe challenge going on 1 ribbon, 2 decorative papers and 3 brads. The black ribbon with white polka dots is from a recent trip to the ribbon outlet. The decorative papers are from a matstack I just got at AC Moore for 40% off - DCVW Citrus matstack. The 3 little apples are brads that I made. I couldn't find a digi from the TDS collection for the Back to School theme, so I used an image by one of their Senior Design Team members. Hope that's OK.
Edit: I can't believe I forgot to credit the image - it's from the Dream Big series, called Apple. You can find her here and all the other adorable images from Inktegrity. Joni, next time I goof like this, smack me! 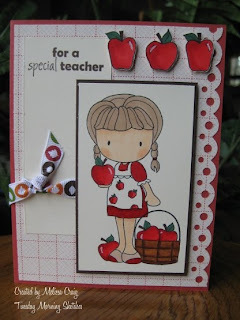 2) Cute Card Thursday's challenge is Back to School. 3) Truly Scrumptious gave us this truly awesome sketch to play with. A little on how I did it: I colored the image with prismacolor pencils and OMS. The stamped the little apples using an image from PTI's Limitless Labels set, then used it to make my brad. I covered the big apple and the little apples with Diamond Glaze to give them shine. The sentiment is computer generated and let me give you a tip on how to print directly onto your decorative paper. In your word program type out your sentiment in a text box and then visualize where you want that to be printed on your paper. Move your text box to that spot. You may have to play with this a bit to get it according to your liking. Print it out on a piece of plain paper. Once you're happy with where you want it, adhere your [my case 4x6] paper to the piece of plain paper with repositional adhesive (I used Dotto) over the print you made on the plain paper. Make sure you adhere well so that it doesn't shift. Place back into your printer and print again. Pull your dp off of the plain paper and voila! 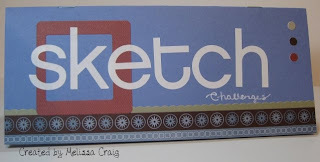 you have a digi stamp placed right onto your decorative paper just as if you used a rubber stamp and ink. Hope you enjoy the card. And today's the last day to get in on the give-aways at MyGrafico Challenge blog, so don't miss out and then we'll be back on Monday with another challenge! It's so good to be back. Welcome to another edition of Thursdays with Lindsay - I do so enjoy this day! Every time I write that phrase it makes me think Breakfast at Tiffany's. I don't even think I've seen that whole movie. Anyway, it also means there's a free digi to find! Happy blog-hunting. 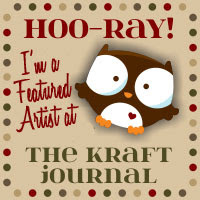 And don't forget the special, spend $5, get a digi-stamp for free. I am participating in Digital Tuesday's challenge. The challenge this week is to use pearls and lace. This card so did not not start out the way it ended, but I am happy with the results and I can't even tell you what I started to do. I love the way cards seem to evolve themselves. 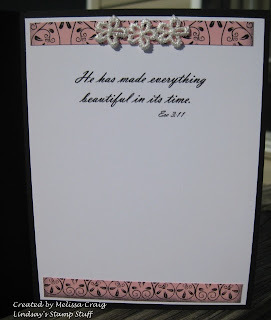 First I used the Elegant Card Kit (b/w) by printing it out on pink card stock. 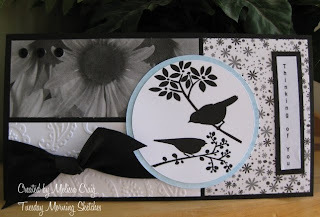 There are two Elegant Card Kits available, one that is black and white and the other is black and ivory. Why I like these options is because the black and white version allows you to be versatile in card stock color choices, but the black and ivory version takes all the thinking out for you just in case you're in a hurry and don't want to think about color choices. I then printed the new Cosmos digi-stamp and colored it with a combination of Koh-i-noor and Prismacolor pencils and OMS. Then cut into an oval shape. The kit comes with 3 backgrounds, so I used the scroll one and then under the flower image I cut a bit larger oval from the filigree background image and then finally matted on black card stock. 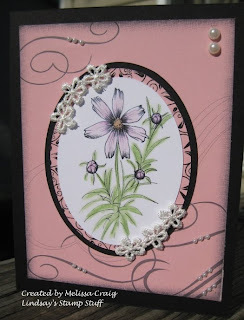 I finished the front of the card by adding bits of lace flower trim to the oval focal image and pearls to the swirls on the background image. On the inside of the card, I printed a Scripture verse (Ecc 3:11) that I originally intended to go on the front, it didn't work out that way. So I cut the card stock to fit the verse to the inside of the card and finished it off with strips of the filigree background and a bit of the lace trim. I hope you like my card. Don't forget to visit Lindsay and the rest of the design team (linked in the sidebar), leave them some love and find the free-digi! Thanks for stopping by. Be sure to check out the MyGrafico Challenge blog for another great give-away today! Hi all! I have a late post because I was waiting to participate in a Wednesday challenge. I did just one today - Color Throwdown. I love the colors they throw at you to use each week! The challenge this week is to used Always Artichoke, Regal Rose and Chocolate Chip. Such rich colors. I dusted off my much neglected Guidelines stamp set from Papertrey Ink. 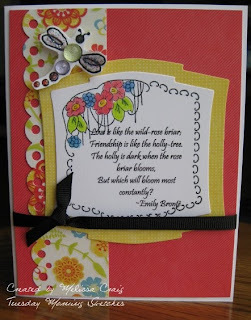 I used the little flower from another Papertrey Ink set, Limitless Labels. These two sets created by background and then cut the scallop out with my nesties die, added the ribbon and then adhered to a chocolate chip base. I used the teapot and sentiment from Unity June KOM. 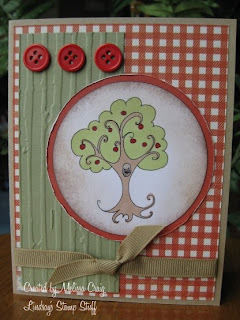 Really super simple card - I can't take credit for it, I saw this on a You Tube video, here. I created the sentiment mounting with a Martha Stewart border punch and then to tie in the little holes from the border punch, I did a bit of paper piercing in the scallop window. I hope you enjoy my card. Thanks for stopping by. 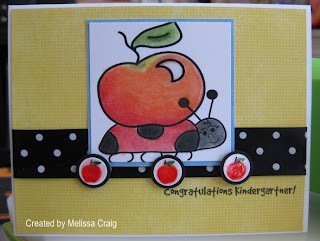 Oh, a word about MyGrafico Challenge blog - there's another great give-away, just make a "Sweet" card featuring candy to enter to win a super cute Back to School digi-stamp set. Good Morning! It's actually quite crisp outside. I love early fall mornings with the slight chill in the air and the warmth of the afternoon. Julie, please email me at tuesdaymorningsketches@gmail.com to claim your prize. Today's give-away at the MyGrafico Challenge blog is the Superhero set. Become a Follower and you're entered to win! Easy! 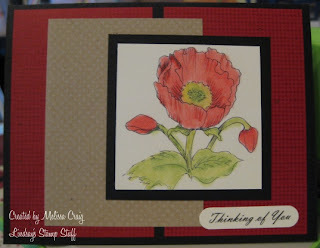 The card I have to share with you today is for Tuesday Morning Sketches challenge. 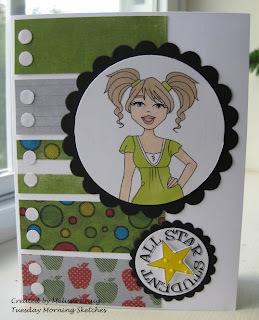 I used Sassy Studio Designs image, which is part of their new release - she's called Back to School Brittany and she's so cute. I also used a sentiment from my friend Jen's digi-shop Say it with Stamps - it's a whole collection of school themed word art digi-stamps, perfect for cards and scrapbook pages. The decorative paper is digi-paper that I purchased from A Cherry on Top. Alrighty, I'm off to throw some clothes on, get Levi out the door and then out for my morning walk. Enjoy your day... visit me over at Tuesday Morning Sketches... and thanks for stopping by.